6 CEMENT AMERICAS • Spring 2018 • www.cementamericas.com CEMENTSCOPE Waste CO2 is captured from Argos' Roberta cement plant using SES' CCC technology. cent of the world's cement production, has identified that carbon capture utilization and storage (CCUS) technologies will be required to achieve 440 of the 790 megatonnes of annual CO2 reductions needed to meet the sector's green- house gas targets. The global CO2 reduction potential of the CarbonCure portfolio of technologies exceeds CSI's CCUS targets by contributing between 550 to 700 megatonnes of annual reductions and creating $26 billion in new net pro- duction efficiencies. 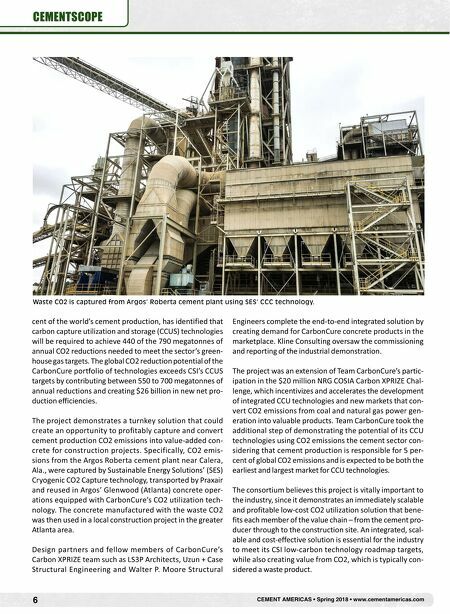 The project demonstrates a turnkey solution that could create an opportunity to profitably capture and convert cement production CO2 emissions into value-added con- crete for construction projects. Specifically, CO2 emis- sions from the Argos Roberta cement plant near Calera, Ala., were captured by Sustainable Energy Solutions' (SES) Cryogenic CO2 Capture technology, transported by Praxair and reused in Argos' Glenwood (Atlanta) concrete oper- ations equipped with CarbonCure's CO2 utilization tech- nology. The concrete manufactured with the waste CO2 was then used in a local construction project in the greater Atlanta area. Design partners and fellow members of CarbonCure's Carbon XPRIZE team such as LS3P Architects, Uzun + Case Structural Engineering and Walter P. Moore Structural Engineers complete the end-to-end integrated solution by creating demand for CarbonCure concrete products in the marketplace. Kline Consulting oversaw the commissioning and reporting of the industrial demonstration. The project was an extension of Team CarbonCure's partic- ipation in the $20 million NRG COSIA Carbon XPRIZE Chal- lenge, which incentivizes and accelerates the development of integrated CCU technologies and new markets that con- vert CO2 emissions from coal and natural gas power gen- eration into valuable products. Team CarbonCure took the additional step of demonstrating the potential of its CCU technologies using CO2 emissions the cement sector con- sidering that cement production is responsible for 5 per- cent of global CO2 emissions and is expected to be both the earliest and largest market for CCU technologies. 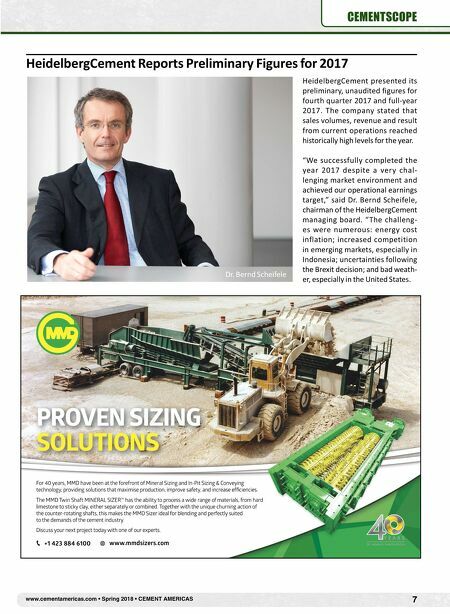 The consortium believes this project is vitally important to the industry, since it demonstrates an immediately scalable and profitable low-cost CO2 utilization solution that bene- fits each member of the value chain – from the cement pro- ducer through to the construction site. An integrated, scal- able and cost-effective solution is essential for the industry to meet its CSI low-carbon technology roadmap targets, while also creating value from CO2, which is typically con- sidered a waste product.